Naturetrek have been creating inspiring Nature Holidays worldwide for 32 years, and it's their passion for Nature which has driven them to become the UK's leading wildlife operator. Their staff are Naturalists, Zoologists, Biologists and Travel Experts... They are happy to admit that they are not IT professionals, or Website experts. 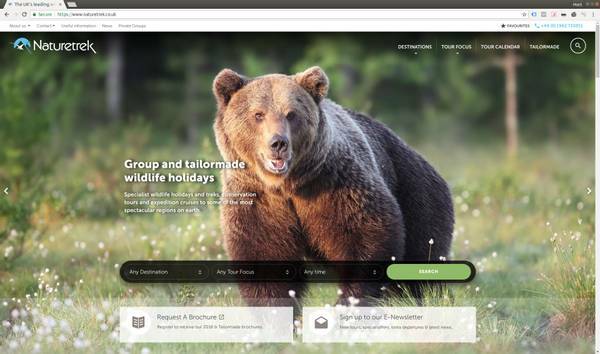 Naturetrek approached us in late 2017 following a frustrating experience with another web agency who didn't understand travel, and didn't appreciate the difficulties they would face in producing a world class specialist travel website. The team were dissappointed with the design and frustrated with the delivery after years of effort. Mr Zen took over the project in early 2018 and started work in February. Our team gave the site a much needed design refresh, making the best of the incredible imagery that was available to us. We implimented TravelZen for managing the tour content and search. We integrated some of the content from their back-office systems including up to date availability and pricing, and we built a booking process integrated with their payment gateway of choice. We helped them transition their data out of their antiquated existing CMS and helped them to load the critical data. They are using AssetZen to manage their enormous library of images. We launched the website in early August 2018 and, from the initial feedback we've received so far, it's been very well received. Thanks very much to you and the team for your hard work and delivery of the site - launching it today was very significant and long awaited moment for our company. Special thanks to Claire for her unrelenting work and positive attitude, she (and all of you!) are really a pleasure to work with. What's more, it's lovely to have you all just down the road! If you are a specialist tour operator with complex requirements, or your current web team are struggling with your requirements, please give us a call!